gives the continuous wavelet transform of a list of values xi. gives the continuous wavelet transform using the wavelet wave. gives the continuous wavelet transform using noct octaves with nvoc voices per octave. gives the continuous wavelet transform of sampled sound. ContinuousWaveletTransform gives a ContinuousWaveletData object. Properties of the ContinuousWaveletData cwd can be found using cwd["prop"]. A list of available properties can found using cwd["Properties"]. 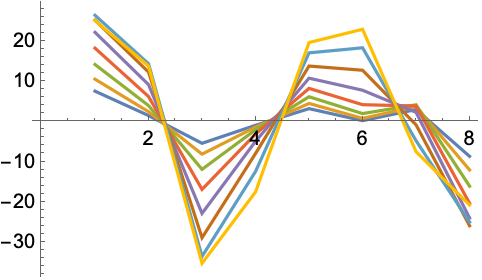 The resulting wavelet coefficients are arrays of the same dimensions as the input data. The default wave is MexicanHatWavelet. The default value for nvoc is 4. The continuous wavelet transform of a function is given by . The continuous wavelet transform of a uniformly sampled sequence is given by . The scaling parameter is given by equal-tempered scale where is the octave number, the voice number, and the smallest wavelet scale. 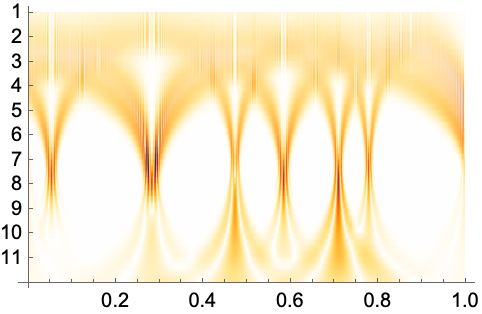 For each scale , the ContinuousWaveletTransform computes the wavelet coefficients . Padding pads the input data to the next higher power of 2 to reduce boundary effects. The settings for Padding are the same as for the padding argument used in ArrayPad. InverseContinuousWaveletTransform gives the inverse transform.